TRUMAN, Harry (1884 - 1972) 33rd President of the United States who led the country in the closing days of World War II and through the re-building of Europe under the Marshall Plan and the Korean War. 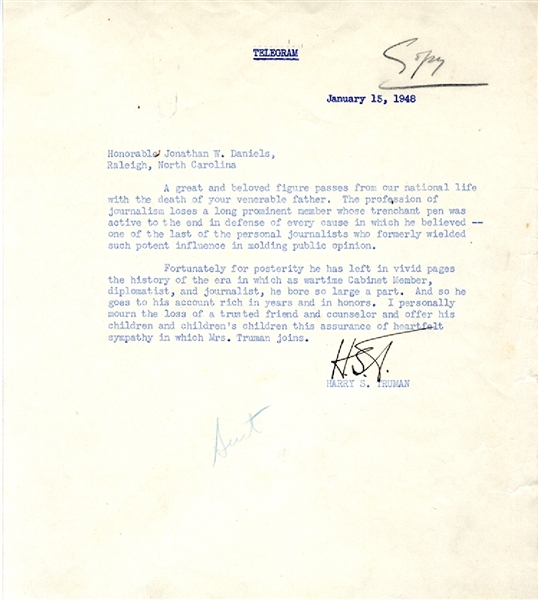 Retained telegram copy, 1pp., January 15, 1948, signed “HST” in which Truman expresses condolences to Honorable Jonathan W. Daniels on the death of his father, Josephus Daniels. As Secretary of the Nayv (1913-21), Daniels handled policy and formalities in World War I while his top aide Franklin Delano Roosevelt, handled the major wartime decisions. As ambassador to Mexico (1933-41) after its revolution, Daniels dealt with the anti-American government and its expropriation of American oil investments.